Swiss rolls (jelly rolls to the Americans) are one of the hardest things for me to make because they always turn out dry and hard. 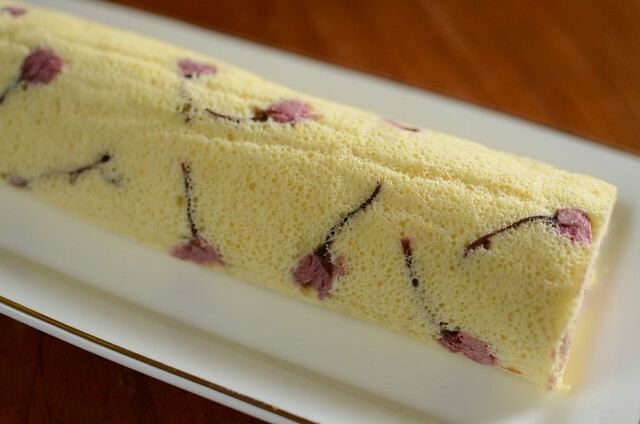 Traditional/western Swiss rolls are made using genoise sponge and the hallmark of the genoise is the crumbly and dry texture, which is why they are often sandwiched with jam and cream. 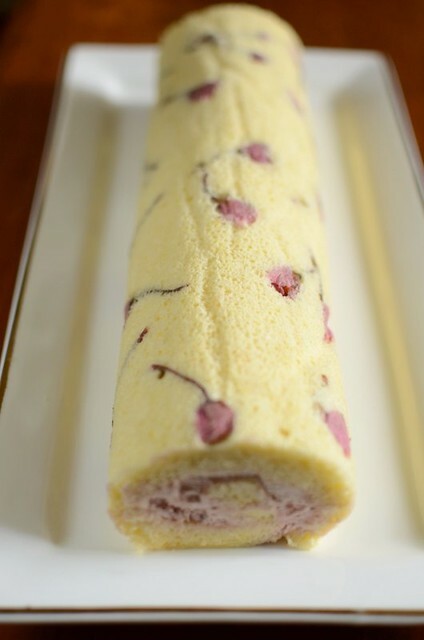 I prefer Asian Swiss rolls for the dense yet soft texture but I don't want to use Ovalette, a magic cake stabilizer that makes fine-textured, soft, no-fail cakes. I asked two bakeries if they used Ovalette and they confirmed that they do. There's no way that I would knowingly feed my family with Ovalette. It looks like waxy orange cholesterol. 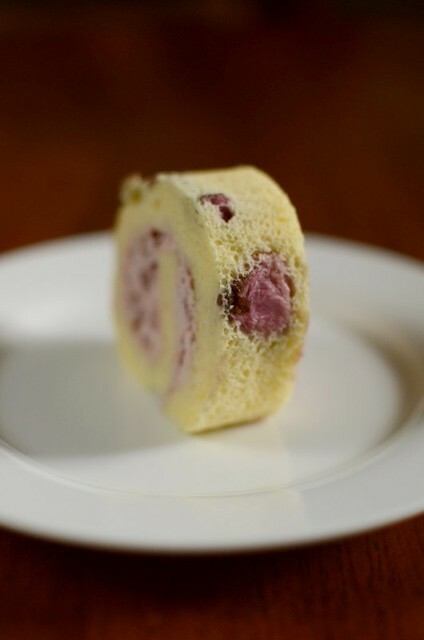 I tried a couple of traditional Swiss roll recipes from the Net but none of them turned out good. I finally gave up on genoise and decided to make my Swiss roll using the separated egg sponge cake recipe. My Swiss roll turned out soft and moist but the texture didn't seem to be the same as in Sotong Cooks. I was tickled to find that my Old Fashioned Butter Cake was among the recipes in the blog. It's an beautiful blog with tons of wonderful recipes; do visit it. There's no information on the person behind the blog but from the recipes and the way it is written, I think the blogger is Singaporean. Which brings to mind one of my thoughts when makng my jellies for the Jelliriffic! Challenge: thank goodness no Singaporeans were invited because there are so many great cooking bloggers in Singapore! After going through 4 packets of my precious salted sakura no shiozuke (remember the sakura jelly? I made another one with gelatine and it turned out much better), I now prefer to leave the flowers quite salty so that the flavor, taste and color are retained. For the first couple of sakura rolls (inspired by the photos here) that I made, I used meringue buttercream flavored with blackberry jam (couldn't find cherry jam) and the filling tasted pretty good. 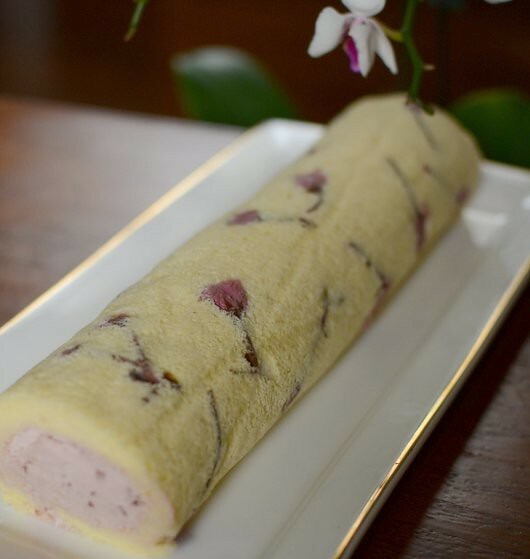 For the Swiss roll in the photos, I used whipped dairy cream instead (less work) and improved the flavor of the filling through a chance discovery. I was cleaning my fridge out and found my daughter's secret stash (I ban dried plums because they have preservatives) of seedless dried plums. I am so pleased with the result because the dried plums tasted like the salted sakura and went very well with the whipped cream. 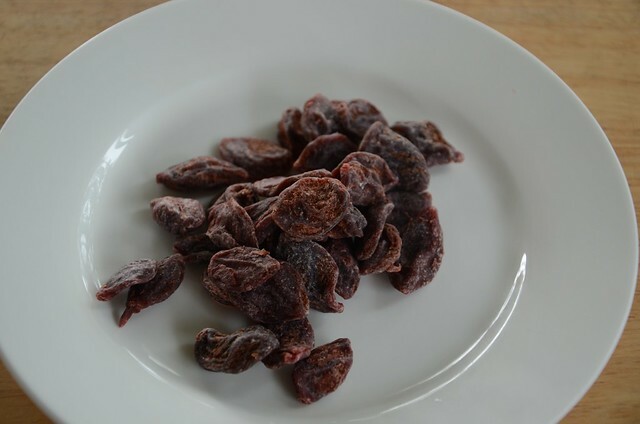 Even the color was a correct match because the dried pulms were reddish instead of the more common white dried plums. Perfect. This is a cake ladies would love because it's so pretty and because most ladies (who grew up eating salted plums) love salted plums. The guys would probably find the sweet and salty taste rather strange. But seriously, if you can, get hold of some sakura no shio zuke and make this prettiest of rolls. 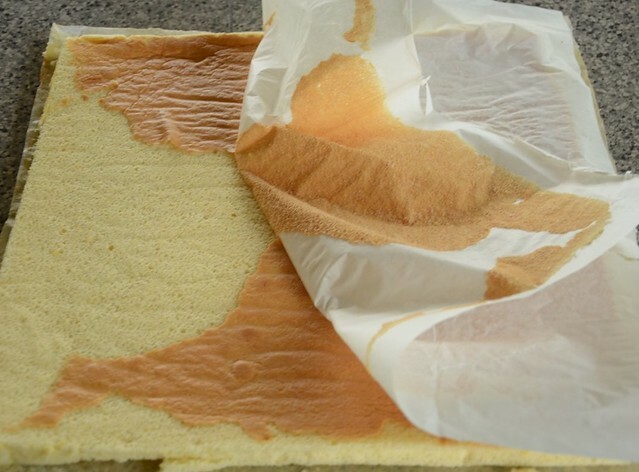 The 'skin' of the roll can be peeled if you invert the hot roll on a piece of baking paper. 1. About 3 hours before baking, wash the sakura flowers and soak in plenty of water for an hour. Rinse and soak again for another hour and repeat. Dry the flowers on paper towels. Grease a 12" X 12" Swiss roll pan, line with baking paper and grease the paper. Arrange the flowers in the first third section of the pan, making sure there's a border of about 5 cm without flowers because that part will be tucked under the roll. 2. Put the yolks, 20 gm sugar, veg oil and water/milk into a bowl and whisk it until well-combined. Sift in the flour. 3. Using a cake mixer, whisk egg whites until frothy and then add the 60 gm sugar, whisking until stiff. 4. Fold 1/3 of the beaten egg whites into the egg mixture to lighten it and make it easier for the rest of the whites to be incorporated. Fold in the remaining white until just combined; be careful not to deflate. 5. Pour batter into the prepared pan, level and bake 8 to 11 minutes or until cake when pressed lightly in the center springs back. Cool cake for 5 minutes in the pan and then turn over onto another piece of baking paper to cool completely. Invert cake onto another piece of paper and peel the brown 'skin' of theSwiss roll off, if like. 6. Spread the cream on the cake, with the part that has no flowers towards you and the part with flowers furthest from you, leaving a seam of 5 cm or more at the edge away from you so that the cream won't spill out. Start rolling from the flowerless part, using the paper to roll and tuck in snugly. You can make a couple of shallow cuts horizontally along the first part of the roll because that part of the roll is more curved and would be more likely to crack. Wrap the roll firmly, tuck in both ends, and chill for several hours before cutting into 1.5 to 2 cm slices. --whisk the cream with the sugar and the jam until stiff. Stir in the chopped salted plums. WOW. I don't know which I like better...the sakura jelly, or this! The cake AND the photos are gorgeous, you've improved a lot! i would have focused more on the front of the roll instead of the middle though (referring to first pic). Colours are just right. I bought a mini-oven and a cake mixer yesterday, second hand. Gonna get busy in the kitchen. Ayi wants to teach me how to make some local dishes! Absolutely gorgeous photos to go with an intriguing cake. 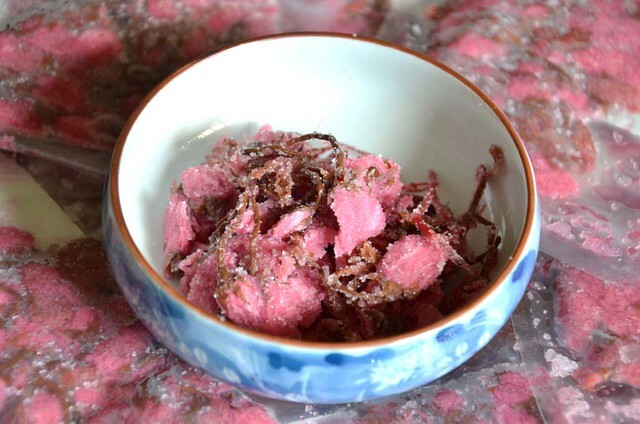 Growing up in Hawaii, I love all kinds of salted preserved fruits, so when i work up enough nerve, I'm going to try this. BTW, I'm intrigued by Hainanese Chicken Rice, which I'm sure you've tasted. Where would be the best place to sample this? I'm curious about the sauce. Some recipes give instructions for a chili sauce, while other recipes indicate a sauce more like what we call "ginger chicken". . . white cooked chicken topped with a salty oil mixture containing minced garlic, scallion & ginger. Happy Holidays! Awesome.....how I wish I could sink my teeth into it. Wow.....Is it yummy? That's a pretty looking cake. I like the mix of ingredients into the roll and not just the filling. Kikukat: I absolutely love singapore's chicken rice! The rice is superb n the chicken super tender n smooth. The chili sauce is traditional, so is fresh grated ginger. Ginger spring onion dip is more for white chopped chicken. I do hainanese chicken rice recipe but I've realized now tt using free range mature chicken is a mistake bc the chicken, while tasty, will be too tough. Happy holidays to u too! So tong: ah, so the paper is to be removed immediately? Tt''s what I shd do! Tq for telling me! Sorry for spelling mistakes-the iPad auto corrects n I forgot to check. But am sure u know what I mean eg. 'god' shd be 'good'. This cake looks really beautiful!! I've never tasted salted plumbs, so I don't know if I like them...but this cake looks good! i have been so busy with work i have not had the time to log on and follow your endeavors these last few months. i must say, you have been a very busy girl of late. the sheer volume of food (jelly? who would 'a' thought?) you have turned out is amazing (as always). i have chosen to comment here on this post in particular becuase i find this cake to be the epitome of high art, food or any other for that matter. i am left humbled by your imagination, dedication, and craft. you have taken what is most often a simple and ordinary confection and turned it into a delicate object d'art. what is even more apparent to me when i look at the photo of this cake, reposed on its long white porcelan dish, is that it exudes heart, purpose and soul. it reminds me of peaceful meditation and the way all things should be made ... with true intentions and purpose. have a wonderful holiday season and i hope everyone is well. It's beautiful! But where do you add the flour? anon: sorry, thnk u for asking. i've corrected the recipe!